SACRAMENTO REGION, CA (MPG) - Sacramento’s largest block party celebrating cars and car culture shut down Fulton Avenue between El Camino and Marconi Saturday, October 6. For a few hours, people set aside concerns, put down signs, and left protests outside of the 10th annual CruiseFest, because, it seemed from the smiling faces, laughter, and dancing in the streets and parking lots, everyone loves a block party with cars. And there were cars to be seen, touched, admired, purchased, and to bring back memories. 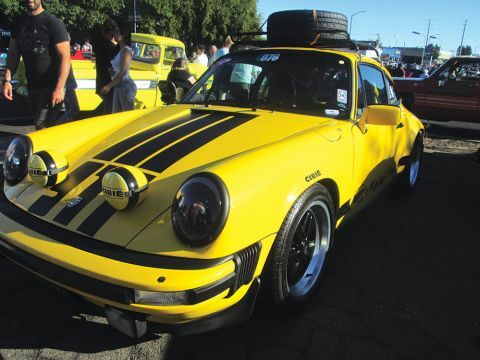 Metropolitans, Porsches, Fords, Chevys, Pontiacs, Plymouths, Jeeps, and even dune buggies showed off their best. Not all of the 360 registered vehicles cruised. That number, up from 2017, was forty cars shy of the cap, according to Fulton Avenue Association Executive Director Melinda Eppler. CruiseFest is a car show equalizer welcoming any make, model, year, or type when most shows set criteria based on those or other factors. It’s rare to see Porsches in a show alongside Gremlins, the Oscar Meyer Weinermobile, or a replica of the ambulance used in Ghostbusters, the 1984 movie starring Bill Murray and Dan Akroyd. “It is a true celebration of Northern California’s car culture,” said Delta Pick Mello, Executive Director of California Automobile Museum. No car show or street festival is complete without the all-important soundtrack, which was ever-changing along Fulton Avenue. Every few paces, the music shifted from classic to alternative rock courtesy of 96.9 The Eagle and ALT 94.7 to hip hop from a passing muscle car to surf music to classic R&B with a side of Rolling Stones, Bill Withers, and Tommy James and the Shondells. Every parking lot, both sides of Fulton, and along both sides of the median housed cars. Sidewalks and streets were jam-packed with the estimated several thousand spectators who walked, rolled, strolled, and sat along Fulton, often roaming out into the street and occasionally joining the procession or receiving goodies from passing vehicles. Families, couples, children, even dogs were part of the event and seemed to enjoy the warm, blustery afternoon. Even bicyclists and skateboarders dropped in on the fun. Participating car clubs included Sacramento Area Miata owners Association, Porsche Club of America-Sac Valley Region, 356 California Alta Region, Metropolitan Club-Capital Chapter, Northern CA Pontiac GTO Club, Burgiemen Capitol City Car Club, Early Ford V8 Club-Sacramento Region, Capital City Mopars, Sacramento Area Mustangs, and the always-popular lowriders club, Family First. Individuals, businesses, and corporations also showed and cruised. Parked along the east side of Fulton, behind a giant blue Volvo with roll cage, were the Oscar Meyer Weinermobile and Planter’s Peanuts Nutmobile. Further down Fulton were the Radio Fiyer Red Wagon and Tribute Team American Graffiti cars. Vehicles flashed their colors – aqua, metallic flake, red, flames, purple, rust, blue, yellow, and one white car with Marilyn Monroe’s image painted on its hood. Others sported colorful rims and wheels. Many had displays showing the vehicle’s restoration. And some highlighted power and what was under the hood. Chrome shone and waxed cars provided an alternate view of the party through gleaming reflections. As they made the U-turn at Marconi, some cars meandered by, taking their time, slow and proper as a beauty queen coming down the runway. Others strutted, head held high, like top models wearing their designer best. A few made sure to be heard above the music and voices, showcasing their power. And many made the turn with little fanfare. “I used to drive one of those,” said a woman when the purple Gremlin began the southbound journey. “I didn’t know they still existed,” said a man. Booths, pop-up boutiques, food trucks, California Highway Patrol, and Sacramento Children’s museum lined the street. Asia Market & Restaurants’ parking lot became a dance party, courtesy of James Powell and his 1971 Cutlass playing R & B dance tunes from waterproof boat speakers installed in the engine compartment. At times, the event seemed to be all about the children who could be found at Sacramento Children’s Museum’s booth in front of the Assistance League’s Fabulous Finds on Fulton shop. Molly Mix, the museum’s program manager, was on hand teaching kids how to play the kazoo and use the catapult to launch Leo. “You’re never too old for a kaleidoscope, catapults, or flip car racing,” she said. Also set up there were California Highway Patrol officer Amy Walker and senior volunteer John Harris who were giving teddy bears to children and offering child safety tips and identification information. Further down, a woman said, “Hey look, it’s the Porsche lot. “Every kind of Porsche you could think of,” said another. It seemed like every type of vehicle imaginable was on hand, including a golf cart doubling as the Zombie Outbreak Response Vehicle. 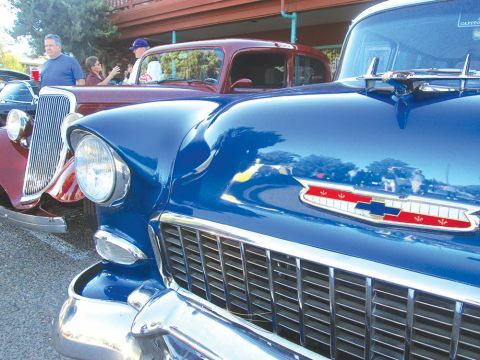 This was the event’s seventh year on Fulton Avenue and is hosted by Fulton Avenue Association for California Automobile Museum, which showcased many vehicles from its collection. “We are very grateful to our volunteers and our sponsors, especially the Fulton Avenue Association for supporting and hosting this event,” wrote Mello in an email. For additional information, visit: www.calautomuseum.org. If you go: 2200 Front Street, Sacramento, CA 95818.